Swish cosmetics major L’Oreal India Ltd is also advertising in regional language magazines and newspapers, which reach mini metros and semi-rural areas. And brands such as Tata Indicom, Mahindra & Mahindra and Amul are widely advertised in the regional media. Print advertising in regional language publications, where regional language is defined as any Indian language, is witnessing a rise in ad volumes. In turn, most regional publications have hiked ad rates by 15-25% in the first quarter of this year. This hike is fed by advertiser categories such as telecom services, two-wheelers and packaged goods—all of which are making deeper inroads into these markets. New categories such as educational institutions, lotteries, banks, vocational training institutes, cars and retail brands such as Big Bazaar are advertising in these publications. In fact, the major advertisers in Malayalam daily Mathrubhumi are LG Electronics India Pvt. Ltd, Maruti Udyog Ltd and Idea Cellular Ltd. The top three regional newspapers in IRS 2006 were Dainik Jagran with 19,071,000 readers, Dainik Bhaskar with 14,571,000 readers and Hindustan. HT Media Ltd, the publisher of Hindustan is also the publisher of Mint. Healthy figures, though as per the hotly debated IRS 2006 findings, all three have seen an erosion in readership figures. Still, as a result of their massive readership, regional newspapers and magazines commanded 41% of total print advertisement volumes in the country including English, shows TAM Media Research India’s data for the first half of 2006, which went up to 43% in the second half of 2006. TAM Media’s study shows that regional print has enjoyed a 4% growth in ad volumes in 2007 versus the English press, which has grown by 3%. In 2007, regional press advertisements occupied 34,827 column centimetres, from 33,484 column centimetres in 2006. English dailies carried 28,843 column centimetres of ads in 2006, which rose to 29,833 column centimetres in 2007. Regional publications have increased ad rates on the back of rising advertiser demand and material costs. Mathrubhumi is one of the biggest reapers of the regional media’s bountiful harvest. Healthy advertiser demand encouraged it to hike ad rates by 10.05% from 1 May 2006 to 1 April 2007. Says M.V. Shreyas Kumar, director, marketing, Mathrubhumi, “We have enjoyed unprecedented growth over the past three years. There has been a 22-25% rise in both advertising volumes and revenues over the past four years. Most significant is our having achieved advertising revenue at par with industry trends. Our own advertising spends have also increased, as we have exponentially increased our exposure." The Bhaskar Group revised its ad rates by about 18% effective April 2007. More than newsprint cost hikes and inflation, the increase was fuelled by higher circulation and more editions, says Bhaskar Group executive director Bharat Kapadia. A lot of packaged goods players still bank on television advertising. But print, more so regional print, has learnt to innovate to attract advertising. Says Manish Porwal, managing director, India (West and South), Starcom Worldwide, “Regional press is often far more open for disruptive ideas and may often be the affordable route to an out-of-box experiment or one great execution." In a launch advertisement for Jeevanprash, they occupied centre position on Dainik Jagran’s front page for maximum noticeability. Earlier, the regional press was ideal for packaged brands aimed at lower socio-economic classes. Now, the readership for this segment is more affluent and moving into Socio-Economic Class (SEC) A, attracting a wider range of advertisers. Explains Shashi Sinha, chairman of media specialist Lodestar Universal Ltd, “Most products target SEC A audiences, and hence are skewed towards English dailies. But I see a significant shift happening. For instance, in areas such as Punjab, the biggest buyers of cars come from the trader segment. 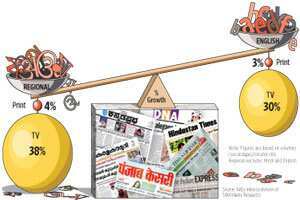 Gujarat is also an area where traders are the biggest consumers of goods, and hence surviving withoutGujarat Samachar or Sandesh in your media plan is impossible." English language dailies aren’t perturbed, though, since advertisement rates are on average 40%-plus more expensive for English versus regional publications. Still, regional advertising is growing and can’t be ignored.